A Lovely Little Life: Elise - 4 Sweet Months!!! Well, Lisey Bell, we have made it through yet another fabulous month!! 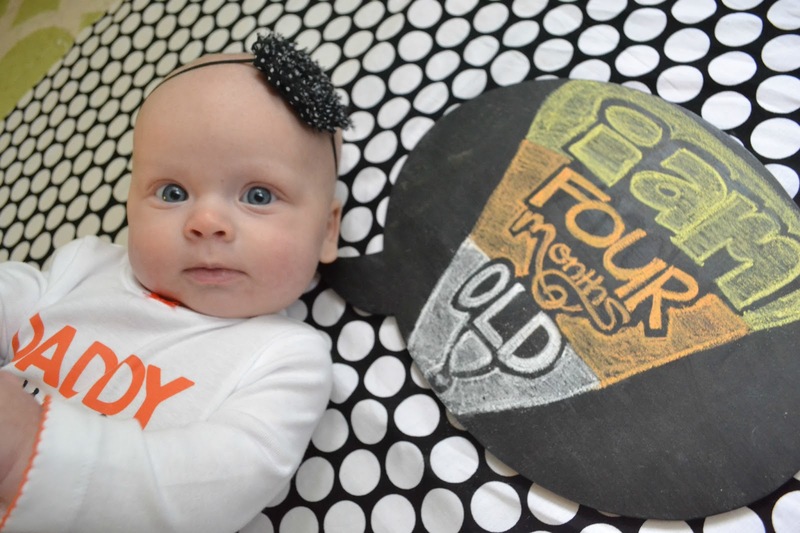 You are a big 4 month old baby girl today!! And this was a fun month! Your little personality is really coming out and your smiles are pretty constant. It is awesome! We went to the doc yesterday and you are weighing in at 13 pounds 7 ounces and you are 24.5 inches and long, both right in the 50% percentile. Your head circumference on the other hand….well, you are in the 75-85%...that just means you have a really big brain because you are oh-so-smart!! :) You got your second round of shots, and you DID. NOT. like them! Momma and Daddy didn’t expect that much because you were so good the first time….this time was way worse, I think we both hated it more than you did. I quickly took you to your Mimi and Papa’s rather than school so you could get some extra pampering! You are borderline still in the size 1 diapers. We are pretty much just keeping you in them until we run out as we had that big ole’ case. We put you in the size 2 at night to make sure you stay as dry as possible…but bless your heart, you still fill those suckers up sometimes too!! Your clothes are still 3 or 3-6 months. 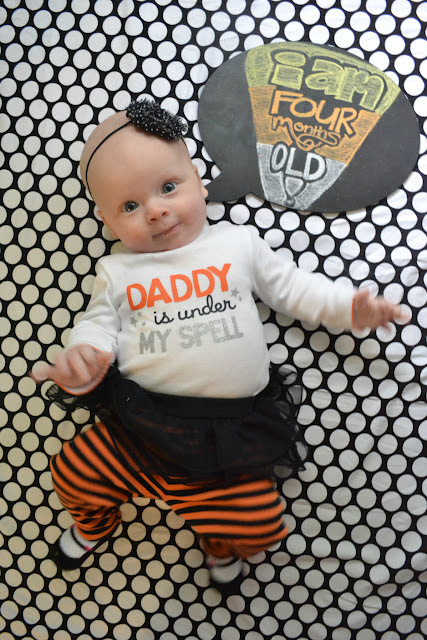 We are slowly breaking our way into some of your adorably cute 6 month clothes….and Momma is having way too much fun dressing you up! J You just look so cute in everything! You are rolling over like crazy! And by crazy, I mean all the time! 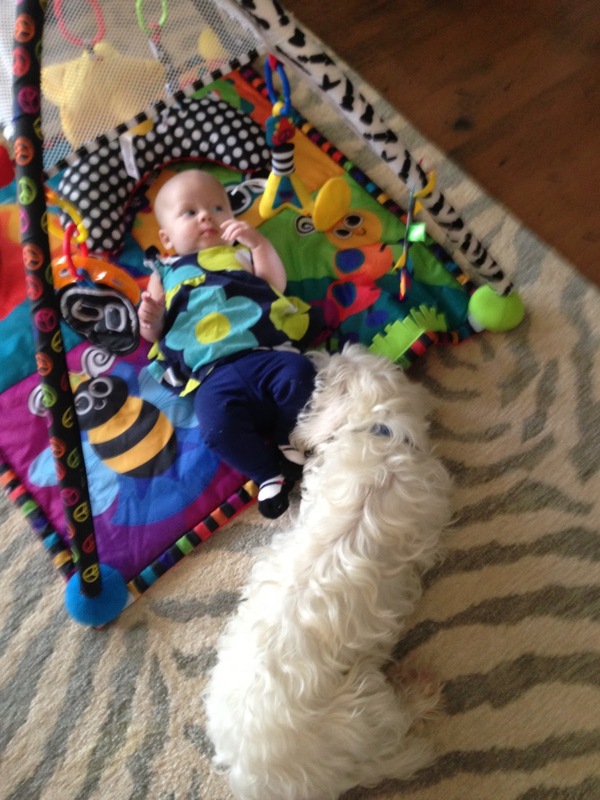 You start off on your activity mat and end up across the room! And you are always quite proud of yourself when you do. We must buckle you into everything now, as I found you flipped over with your feet hanging off in your swing. Momma had a slight heart attack and then giggled because you were again, quite proud of yourself! Speaking of your swing….you are over it. Gone are the days of Momma putting you in there for a late afternoon catnap to get chores done! But it’s okay, because you have some new loves! You love your mat, you love to check yourself out in the mirror, then roll over to your belly and talk to your friends on the mat. When you get bored with that you love your exersaucer! We just put you in this about 2 weeks ago and we are all loving watching you in it! Love, love, love your hands! They are always in your mouth, more specifically…..your thumb. You started sucking it when you were sick to fall asleep in your crib, now it’s pretty much a nightly event. You only do it for a few minutes, but that’s enough to drive Momma crazy. I fought it at first, but it was the only thing that would soothe you, so I had to let it go. Still working on that…. 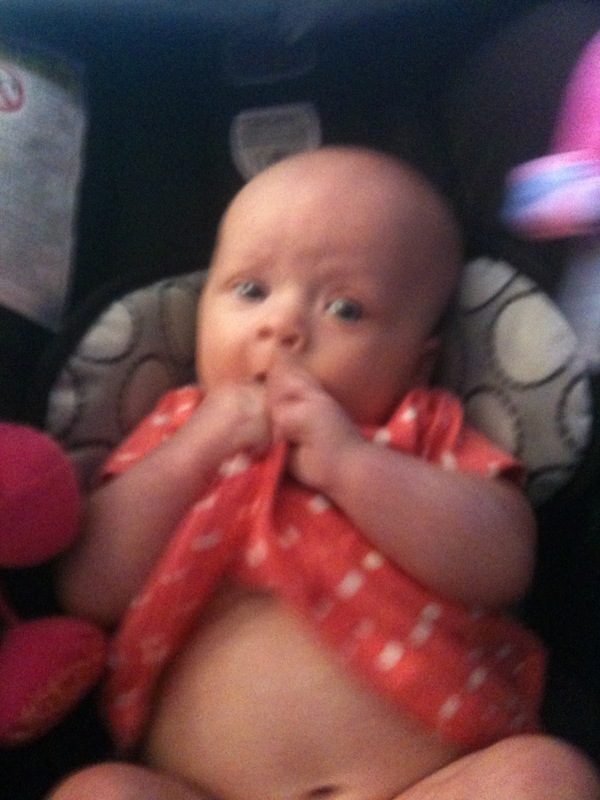 On that same note, you are not liking your paci as much. About 2 weeks ago you just decided you didn’t want it anymore, wouldn’t take it at all! 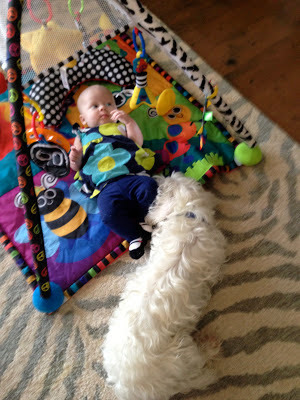 But then yesterday I thought I would try out one of the other brands as I read that when babies start teething they like different kinds…and that seemed to have work. You like this little gem so far! You absolutely love being on your belly! You lay on your belly with your legs and arms and head all up, kind of looks like you are sky diving, ha! You also sleep on your belly now. Daddy and I just go ahead and put you in your crib on your belly as we now that is how you will end up in a matter of 30 seconds! You have also decided that you won’t let us rock you to sleep in your carseat, this is very sad news. I about had a panic attack while at dinner the other night, and then Momma got creative! We had you stroller in there and laid it flat and voila! You were out! And yes, sucking that thumb! Whatever works, right moms?! You love looking around! You are totally not cool with your car seat other than being in the car or the swing or laying in our arms like a baby. You MUST be sitting up or on our shoulder so you can see every little thing. A very alert little girl, you are! Check you out sitting like a big girl in your stroller! You still love your bath time, you are starting to play with toys while you are in there and it is quite precious! You love "standing up", it's one of your favorite past times. You feel (and look) like such a big girl! We just bumped you up to 6.5 ounces for your first 4 bottles (7, 10:30, 1:30, 4:30) and 7.5 ounces for your bedtime bottle (7:30), you started getting very upset when your bottle was done and this seems to help. You love to eat, and I mean LOVE! We are also going to start you on your first attempt at rice cereal tonight! I think you are slowly going to stop sleeping as long, but we'll see - you do like your sleep, just like your Momma! 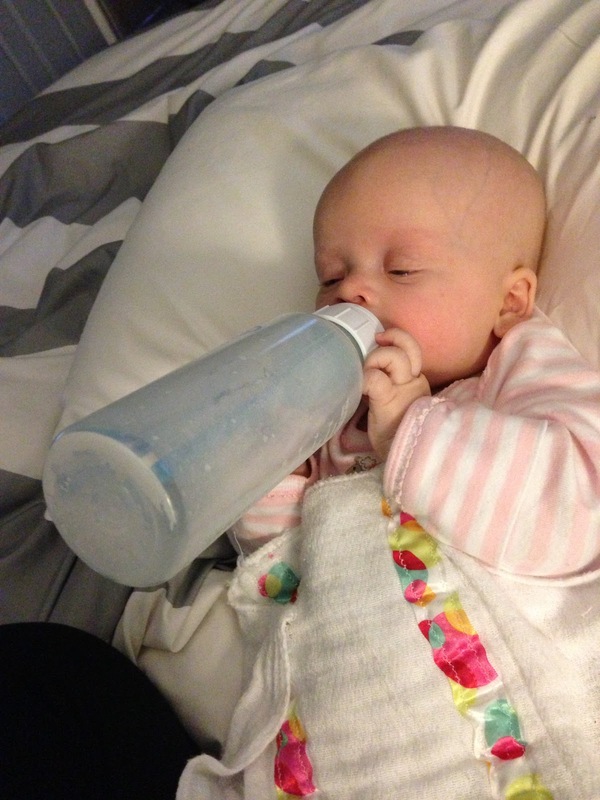 Held your first full bottle! - October 18...okay so it only lasted about a minute....we were still quite excited! Month number for was a good one! 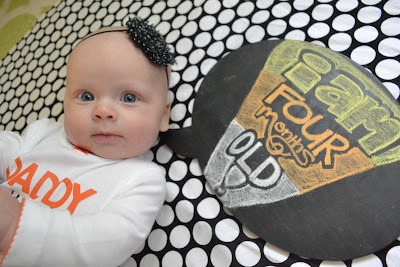 :) I still can't believe you are four months and counting, Little Miss! I keep telling your Daddy, we have a real baby now! As opposed to a tiny little newborn :). You are so fun, and we kiss that sweet little head of yours every night thank God and our lucky stars for you! You are so very very special and we know how blessed we are to have you. I know, I know, I think I get sappier every month! So, so sweet!! First ear infection :( Not fun! Cam has a little cold and sounds so pitiful!! I so love reading these posts about babies just a little older than Cam so I can know what to expect!! 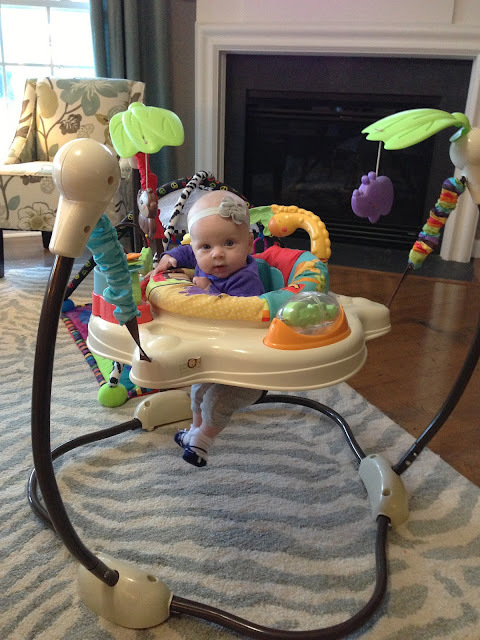 We are on the lookout for an exersaucer...I will definitely check out the one you suggested! I can't believe how fast they are growing...they are turning into little people!! Just wondering if you are going to start her in the new MOC schedule once you introduce the cereal to her diet. My little guy has his 4 month appt on the 1st so I am going to wait until then to start anything... but if you do, I would love to hear about how it goes!! We had our first cold too, no fun! You're lucky she didn't mind the boogie sucker! Beckett would scream every time I did it & it was heart breaking! She is such a doll. I laughed out loud at her under the table. We just had our first ear infection too- it's PITIFUL, even if they don't act like it's bothering them! When did you start moms on call? I'm nervous, but it seems like everyone has great success with it! The way you do her "conversation bubble" each month is so cute and creative! Oh my gosh! She is such a cutie! I love the picture of her in the stroller! Such a good idea. Ahh such a big month! She just gets cuter and cuter every time I pop over to check her out! Growing so big too!